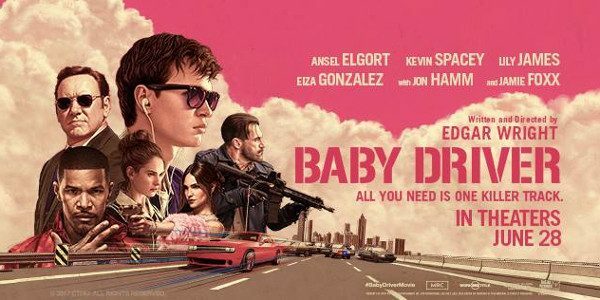 Let me give you a word of warning when entering Baby Driver, Edgar Wright’s fifth film as a director and his first as a solo writer. If you don’t like things loud, this won’t be the movie for you because it is made up of two noisy variants: car chases and music. Loud music. Loud, incredible, masterful music. In fact, you could say the driving force behind this film is the soundtrack. This could be the first action musical, it’s that important. If you thought Guardians of the Galaxy had bagsied on the soundtrack market, think again. Baby is a getaway driver working for the mysterious businessman-like, Doc. With his dark shades and iPod earphones as part of him as any of his body, Baby is the best, managing to get bank robbers out of dangerous situations without even breaking a sweat. This isn’t the life Baby wants to live, as he shares a home with his deaf foster father and he is falling for diner waitress, Debora. Things start to go awry when Bats arrives on the scene and gets Baby involved in a heist that is doomed to failure. What is quite remarkable from the opening minutes of the movie, when Baby, waiting for the newly delivered bank robbers to return with their ill-gotten gains, starts playing The Jon Spencer Blues Explosion and Bellbottom, that this isn’t a movie with random songs thrown together to make a cool summer listen on Spotify. The beats, the rhythm, the tone of each track used drives the film along, from the editing to the sound of gunfire and yet it is never placed there for mood purposes. We don’t get a love song because it’s a love scene, we get the Commodores Easy because it’s part of his make-up. Wright has carefully chosen each piece to bring the fullest effect to the visuals, which, if you are a fan of Mr Wright’s work, you will know he has a unique style that is a personal signature. Add to the equations the fact that Edgar Wright loves movies and you can spend hours referencing the various nod to other movies (Michael Mann’s Heat, Walter Hill’s Driver, even Monsters Inc gets a mention and a big laugh). This is a film that hasn’t just been rushed out to capture a more mature audience member during these summer days but a work of art, meticulously put together, nurtured and then delivered with care and attention. The plot keeps the attention and the set pieces are magnificently executed. You may experience Deja Vu watching, as we go from one car chase to another but Wright makes each one individual and just as exciting as the next. What is also impressive is that the cars are being driven by proper stunt men and not green-screened or computer generated. Where the film does suffer slightly (and I am being picky here) it’s the relationship between Baby and Debora, which feels somewhat shoehorned in so that there’s some tension later on. Her character doesn’t really develop into anything but a damsel in distress, yet when the film goes into its quieter moments, it is perfectly acceptable. If the soundtrack is the coolest thing you’ll hear all year, then the cast is even cooler. Ansel Elgort should become a star after this. A youthful innocence hidden behind dark shades, yet totally believable when behind the wheel, he manages to out cool Ryan O’Neal’s getaway driver in Driver. Kevin Spacey is always good value while Jamie Foxx does psycho extremely well. Baby Driver is a blast. It’s fast and furious and oozes cool from every pore. Edgar Wright is a visionary filmmaker who loves movies, understands them and makes mini masterpieces. In years to come this will be a regular on the cult circuit so see it now and then brag about watching the smartest, the most adrenaline-fuelled movie of the year before the cinephiles get hold of it and claim it for their own.